All myDESIGNER windows are organized into panes. You can move the windows arbitrarily as the designer remembers the positions of both automatically and manually closed windows until the next time they are opened. Each window can be dragged away from the workspace and will stay undocked until you dock them again using the key combination Alt+Shift+D. You may resize the windows as well. 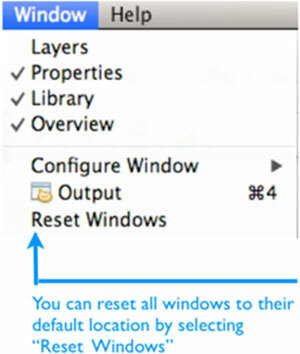 If you wish to return all the windows to their default state, use the Reset Windows command from the menu Window –> Reset Windows. Note: The red preview box indicates where the window will appear once you drop it. Some windows appear only when you are performing a task to which they are related. For example, the Layers window appears only when you are designing a screen view. In the Window menu, you can select which windows will appear automatically. This window displays a tree structure of all opened projects and the list of devices running mySCADA. List of available devices from/to which you can load a project. Here you can find all iPods, iPhones, iPad Touches, Android devices, Raspberry PI devices, mySCADA Boxes, mySCADA Pros, and server PCs to which you can connect. You can also specify the device manually to access remote network devices. Note that it may take a few minutes to find all devices available in the local network. This window shows a preview of the selected view; otherwise, it is blank. This window allows access to object and project properties. The properties of specific objects are described in the relevant chapters. 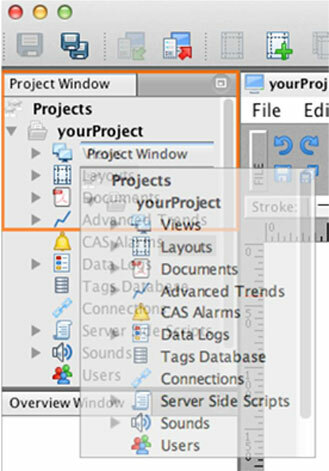 This window is your main working area where the content of all project elements is displayed. 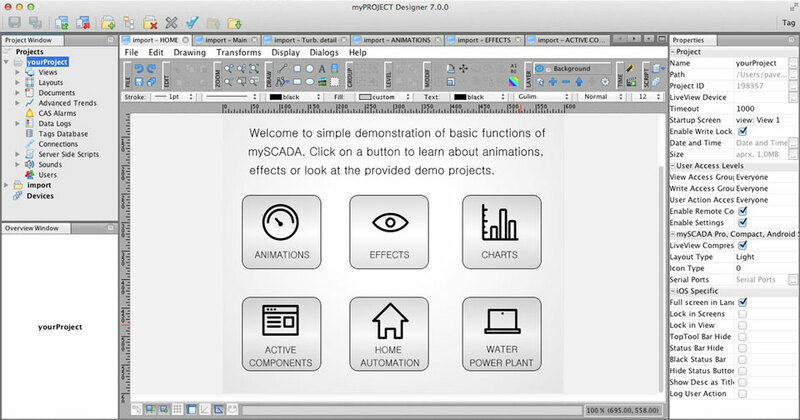 It gives you the ability to draw graphic visualizations, change connection details, and alter alarms or trend details. The script editor also uses this window. This button expands the list of all opened projects and selects one of them. The arrow next to the project name will point to the project that is currently being displayed. This button maximizes the main window by docking all other open windows. These buttons are used to switch between different opened tabs when the tabs do not fit into the main window.